This is what Posey’s allergist said to us in a recent discussion regarding her ongoing constipation. Constipation, ugh. I know, just the sound of the word is such a downer, right? And the absolute WORST is hearing the GI specialist say the dreaded words “functional gut.” Have you gotten this before? The functional gut speech? Doesn’t it sound like your math teacher lecturing you on benefits geometry in the real world? It is sometimes as if the GI doc hasn’t ever seen a kid poop before? Like there are really no practical applications to those words at all. First of all, doesn’t functional gut mean that the gut is functioning properly? Which I can tell you first hand, 1,472 Miralax cocktails later, it CLEARLY is NOT. Not functioning, not proper, and not a simple or common problem, at all. But, one of the positive changes I’ve taken out of all of this is stepping up our daily walks (we are still not perfect, there are just days it doesn’t happen) especially during the winter. Doctor’s orders are on any days over 20 degrees we’re to head out — 10 minutes out and 10 minutes back. Seems pretty simple, right? So why don’t you join us on our 20 minute walk revolution! Constipation or not, we can all benefit from fresh air, stretching our legs, getting out and connecting and talking. Posey & Millie love their walks! 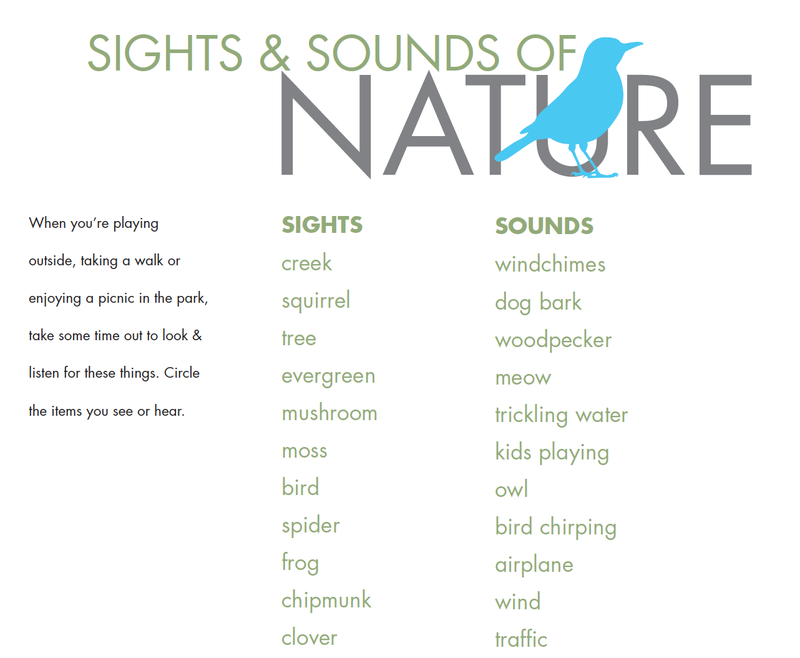 And to make it extra fun, I’ve developed this Sights & Sounds of Nature Checklist. (Just click on the link to download a PDF and print up as many as you would like!) It is a great way to engage your kids with their surroundings while you’re out and about. And we all know how important nature is for kids. Please let me know how your walks are going! This entry was posted in Nature and tagged checklist, children, connecting, constipation, fresh air, functional gut, miralax, mom, nature, parents, walks on January 26, 2013 by poseyplays.